'The Vin Bin' is holding its first ever ale tasting event tonight, from 5.30pm to 8pm. The free tasting will be hosted by Julia Perthen from the Hepworth Brewery who will be showcasing their ales and beers including the fantastic blonde organic lager. 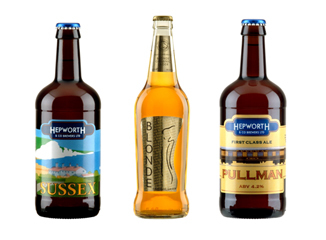 Now employing 20 staff in West Sussex, Hepworth & Co. produce beers and lagers of distinction in cask, keg and bottle, using locally sourced ingredients wherever possible. All are welcome to the free event this evening - and inspired by this I shall, in future, no longer be apologetically informing Mrs WP that I am 'off down the pub' but I shall be declaring in my best posh voice that I'm 'just going for an ale tasting session, dear'.